If ever a country deserved to be scrapbooked for posterity, it's Italy. If your Italy scrapbook is all that remains of your possessions in 5000 years then our distant descendants will know that at least we were once civilised! OFFCUTS - BY THE OFF-CHANCE! I got the idea for a gondola layout when I discovered perfect gondola-shaped offcuts in my bin! I'd been cutting Bazzill basics black cardstock around my oval template for another layout. The offcuts were just what I needed to start this page. Since then I've been careful not to discard offcuts too quickly - which doesn't help my natural untidiness! SKETCH TEMPLATES? WHAT HAVE THEY EVER DONE FOR US?! I could never be bothered with mapping out my layout before I started - let alone sticking to the plan. However, Jen Gormley's excellent '500 Scrapbooking Sketches' might just be changing my mind. If you look at this page , about half way down you'll see a great example of how a simple line-drawn template can help you create a stunning layout. I like the idea of being able to use the template for many other pages and themes as well. As this page features in an Italy scrapbook, I thought the Italian flag would be a striking backdrop to this layout. With slightly more complicated flags, the US and Australia come to mind!) I might have shied away from that idea. But for national flags with bands of bright colour, - France, Poland, Ireland, Germany, Belgium, Holland etc) then you can really use that 'look and feel' in your layout. 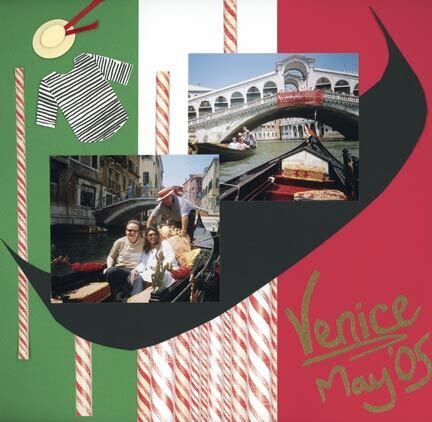 The 'Venice 2005' page of my Italy scrapbook was an early attempt at heat embossing. I marked out the letters in free-hand (if you hadn't already guessed!) with my acid-free Zig glue pen. I then poured gold embossing powder over the letters, catching the excess in a tray. (I didn't want to waste any. It's like gold dust). I then heated up the powder until that defining moment when the powder changes colour and you know you're home free! The little Gondolier's outfit was an afterthought, but I think it helps to add some flavour to this Venetian layout. I topped off a VERY free hand shirt design on white cardstock with a little Gondolier's hat. For this I used a glue-dot to stick the crown to the brim of the hat - which held the ribbon in place at the same time.